A Beauty Affair - A Singapore Beauty & Lifestyle Blog! Beauty Reviews & More In Here! 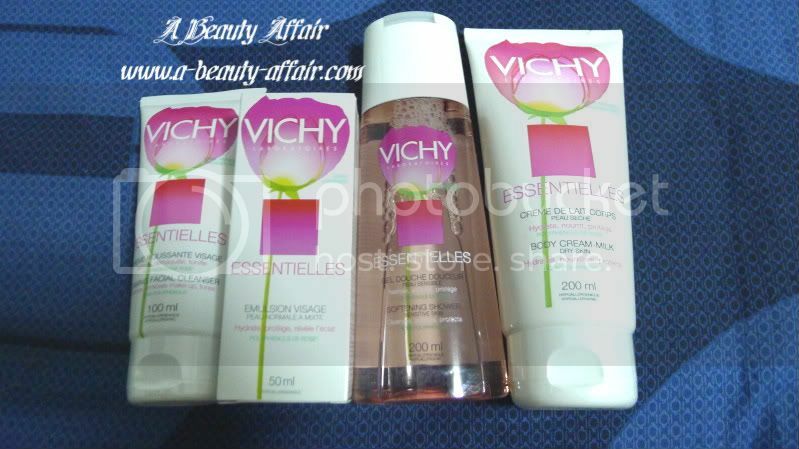 : [REVIEW] Vichy's Essentielles + How U Can Win A Set too! What's interesting about this skincare range is that it's affordably priced and it also comes with the body care products too. If you thought the 3rd bottle from the left above is the toner than you are so wrong. It's actually the shower gel and the tube next to it (extreme right) is the body cream! If you have a normal skin type and no particular skin concerns then this is the range for you. Vichy Essentielles is a basic FACE & BODY care system that focuses on the skin's essential daily needs for its health and beauty. Embracing pharmacy values of tolerance, and with efficacies that are instrumentally measured and tested on sensitive skin under dermatological control. 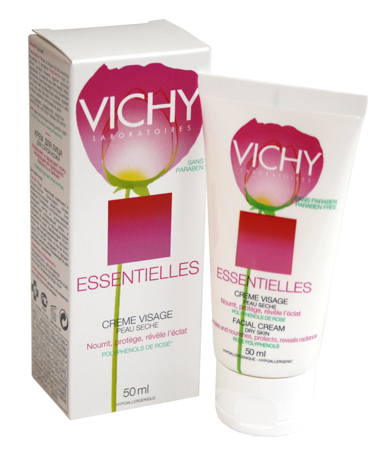 Vichy Essentielles hydrates, protects and reveals skin's radiance. This Vichy cleanser contains 21% of Glycerin which is a moisturizing active ingredient. As you probably know, I'm a big fan of such 2-in-1 hassle-free cleansers. It has wow-ed me because it not only cleanses but also removes makeup; including eye makeup. The texture is smooth and creamy; foams up easily and effectively cleans makeup. Skin feels fresh and clean, soft to touch too after using. This facial emulsion contains Shea Butter which has nourishing and emollient properties, as well as Allantoin (this comes from the roots of comfrey - a perennial plant) that has repairing, softening , moisturizing and calming properties for damaged or fragile skin. This moisturizer is suitable for both normal and combination skin. It's texture is light-weight and absorbed instantly!! It also did not break out on me, the scent is a light floral fragrance which you will find in the shower gel and body cream too. You can use this daily and you will find makeup going on smoothly after application. This is one refreshing shower gel with a faint floral fragrance. I love that the scent is light and not overpowering for I am not that much into flowers. The texture is slightly runny but lathers up decently. And it gently cleanses, softens and protects the skin with Polyphenols. Give your skin a yummy treat with this body cream after using the Essentielles Softening Shower Gel. Like the emulsion & shower gel, it contains the same light, refreshing floral fragrance. This body cream contains Shea Butter and Polyphenols which hydrates, protects and reveals skin's glow. I like to use this after shower because I sleep in an air-conditioned bedroom and this does me the adequate moisture I require. Vichy Essentielles products can be found at VICHY counters in selected Watsons, Guardian, Unity & Nishino pharmacies; and all major hospital pharmacies.